The PESA Executive Address Series is an opportunity to hear first-hand what’s on the minds of industry leaders. 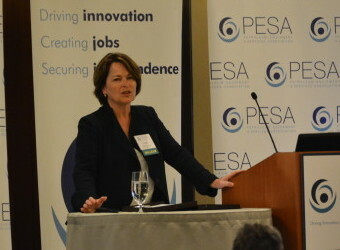 The featured speaker was Susan Cunningham, Executive Vice President of Environment, Health & Safety Regulatory and New Frontiers at Noble Energy, who shared her knowledge and experience of more than three decades in oil and gas. She imparted career and leadership lessons, pitfalls, and guidelines that only a lifelong career in oil and gas can provide. The corporate sponsor of this event was FMC Technologies, Inc. and was the tenth in the series. With over 30 years of industry experience, Ms. Cunningham dealt with the gender challenges of climbing the corporate ladder in a male-dominated industry by not acknowledging them. This attitude she says helped her break many firsts in her career, including being the first woman to head an overseas office for Amoco and to land a C-suite position at Noble Energy. An industry pioneer, her career has spanned five countries for more than three decades and her unbridled success is marked by a survey in 2010 where she was among only 19 women on a survey of the 500 highest-paid executives at Houston’s top public companies. While at Noble Energy, the business has grown from $2.5 billion in market cap when she joined in 2001 to more than $25 billion now. Noble’s astounding success, she explains, is based on innovation through group creativity, where they use the spirit of innovation to introduce new ideas such as a new method of drilling that eliminates a significant amount of water hauling, called EcoNode drilling at onshore drilling projects in Colorado. “Businesses tend to minimize the kind of interactions that lead to new ideas,” Cunningham said. “The shortage of new ideas eventually leads to a decline in profits.” But she stresses that profits are not the only place where industry makes a contribution. For instance, in Equatorial Guinea and Cameroon in West Africa, Noble has had a string of exploration successes with financial rewards, but equally important is the $13 million investment to fight malaria and other investments into schools and rebuilding. 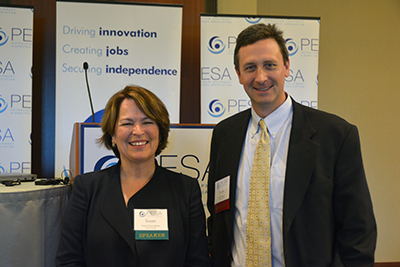 Susan Cunningham, Noble Energy, and Past PESA Emerging Leaders Committee Chairman Brian Swagerty, FMC Technologies, Inc. Her job also allows her to see how industry makes a positive difference in economies, environments and health, which is very rewarding in her career. Her commitment to encourage positive growth for the future of the oil & gas industry by acknowledging the people it serves is a strong example for others. 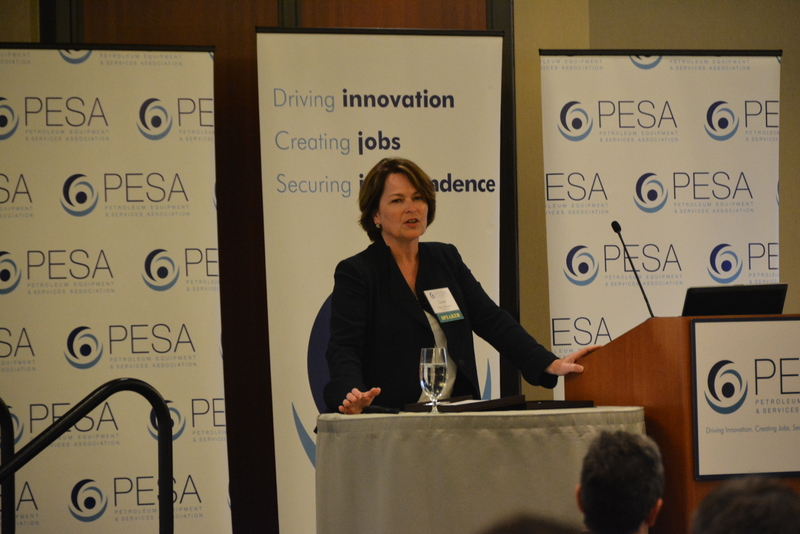 PESA’s ongoing executive address series continues to provide a platform of shared knowledge for seasoned oil and gas executives to provide the industry’s next generation of emerging leaders with valuable insights. “I attended what I consider to be a one of the best talks on leadership at the Emerging Leaders Executive Address. Susan Cunningham’s presentation provided a practical pathway to excellence in leadership and her accomplishments provide credibility to her message. I thanked her in person for her words of wisdom and have since shared them with my team,” said Emerging Leaders Chairman Amar Thiraviam, VP, Teledyne.